Whether it was scaling the treacherous Peng Kang Hill in Jurong, being part of the pioneer batches trained by the Israeli Army, or simply taking the ferry from Tanah Merah to Pulau Tekong, the memories of National Service still resonate very much in the minds of the over 900,000 male citizens who have completed their National Service (NS) duty ever since it was introduced under the National Service (Amendment) Bill in 1967. Prior to the NS Bill of ’67, the British had actually tabled their own bill back in 1952, on the grounds that a nation seeking self-government should be able to defend itself. The Ordinance was enacted on 1 March 1954, and required males between the ages of 18 and 20 to register for part-time national service. The first 1,000 national servicemen were chosen via public ballot on July 1954, and were drafted into the Singapore Military Forces and Civil Defence Corps. Protest by Chinese Middle School students would however see a quick end to the bill, highlighted by a demonstration on 13 May where some 500 students held a protest against the bill by marching to the Government House. They eventually clashed with the police, resulting in 26 injuries and 45 arrests. The incident slowed down the enlistment process greatly, and the National Service Ordinance eventually fell through. The need for a capable defence force in Singapore was highlighted by two key events during its early years of independence, that of Singapore’s separation from Malaysia and the impending withdrawal of the British Military. The monumental task was put into the hands of then Defence Minister Dr Goh Keng Swee, and began with the introduction of the Ministry of Interior and Defence (MID) in August 1965, followed by the People’s Defence Force (PDF) bill on 30 December on the same year. 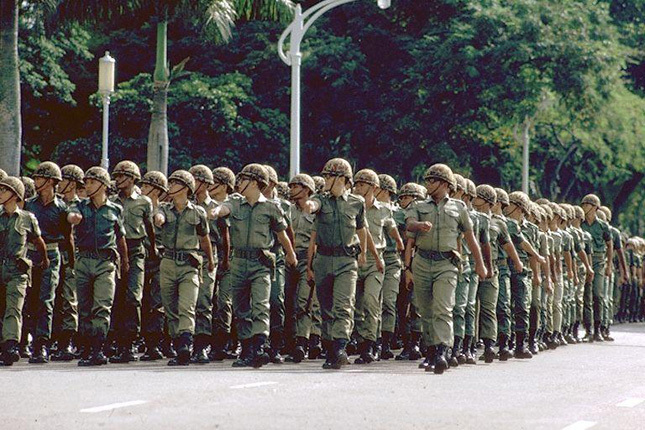 By March 1966, some 3,200 volunteers had already registered with the PDF, but their lack of military training and small numbers soon made Goh realise that compulsory conscription was needed to vastly expand Singapore’s defence force. On 14 March 1967, when the second reading of the National Service (Amendment) Bill and was passed, Goh declared that an initial batch of some 9,000 male youths born between 1 January 1949 and 30 July 1949 would be eligible for their National Service callup. The enlistees would serve in one of four branches, namely the full-time army, PDF, Vigilante Corps and Special Constabulary. Those that were not selected for the army were allocated to the other divisions where they did only part-time training during their off duty hours, ensuring minimal disruption to their other career pursuits. 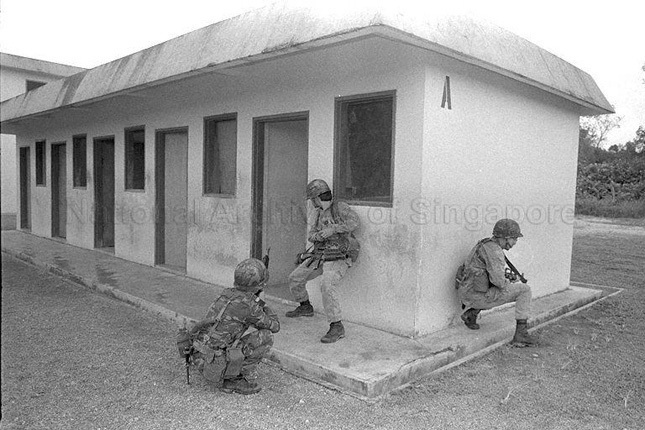 The first batches of eligible NS enlistees were registered at four stations located at Kallang, Katong, Serangoon and Bukit Panjang during the period between 28 March and 18 April 1967. All important documents had to be presented, and failure to register would result in an imprisonment of up to six months, a fine of S$2,000, or both. In the early years of National Service, a lack of knowledge and amenities would see the pioneer batches trained by members from the Israeli Armed Forces, together with limited equipment as well as the iconic No.4 uniforms made from “Temasek Green cotton drill” – known to be so highly starched and pressed that they were able to stand on their own! 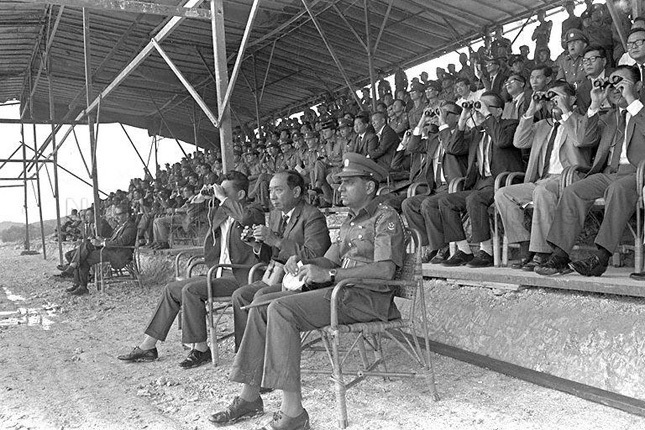 In 1970, the MID would diversify its operations, leading to the establishment of the Ministry of Defence (MINDEF) and the Ministry of Home Affairs (MHA) to oversee all military related matters. 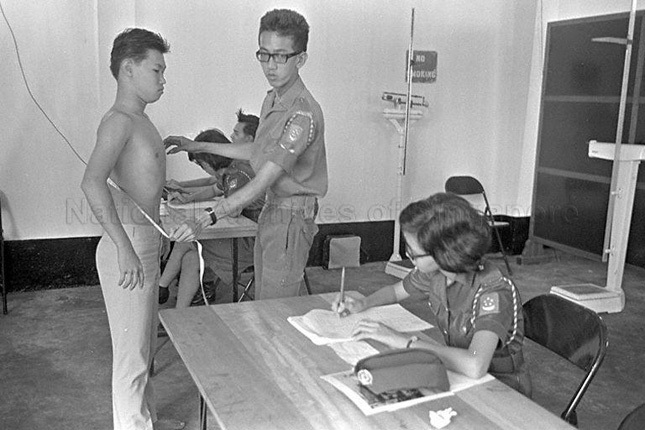 Over the years, National Service would also experience numerous changes and improvements, including the introduction of the Individual Physical Proficiency Test (IPPT) in 1980 as well as changes to the Basic Military Training (BMT) structure to accommodate enlistees who were either obese (1991) or achieved inadequate results in their IPPT (1993). Today, there are a total of over 40 army camps, 2 naval bases and nine air force bases around the island equipped with the latest technology and facilities that have made the Singapore Armed Forces (SAF) a well-respected army the world over. 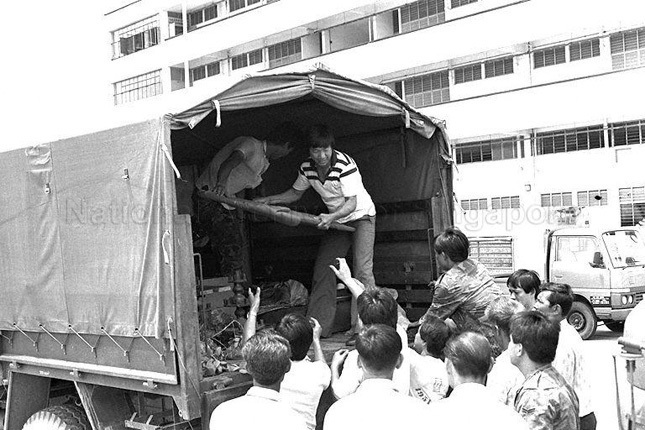 Beyond regular training of National Serviceman, the SAF has also been readily involved in providing aid at critical junctures both in Singapore (Laju incident in 1974, Hotel New World Collapse in 1986) as well as humanitarian relief efforts overseas (Medical Mission to East Pakistan in 1970, “Operation Flying Eagle” for the Indian Ocean Earthquake and Tsunami in 2004).